Look at my Jazz Hands ! Look at my Jazz Hands ! Our mate ‘Jazz Hands’ Gemma decided to celebrate her 30th Birthday by camping in a field in Kent. We took the bus along and met an old mini, a range rover and two land rovers. Just to make things absolutely clear, A Land Rover is not a jeep. Don’t ever say to a Land Rover owner “Nice Jeep”. They get all upset. Hang on a minute? Let’s think this through properly. If you ever meet a Land Rover owner then do say “Nice Jeep”, it really upsets them. Last time I looked Gemma was 23 and all of a sudden she’s knocking on 30. How did that happen? The Jazz Hands is an observation on her running style. Imagine a girl running with her hands in the air, in front of her, waving about, shouting “Look at my Jazz Hands”. A funny sight. Gemma’s feller, James, has a Land Rover / Jeep thing and so do all his mates. And why not. I don’t think the girls get it, but I think the boys kind of understand. Fresh from our road trip to France (yeah this blog is now two whole years behind) the jolly down to Kent was a breeze. When we arrived all the vehicles and tents were arranged in a circle just like a cowboy camp. Perhaps there were some Red Indians kicking about these parts we needed to be wary of? Whatever, I was looking forward to a supper of beans and Wagon Wheels and an evening of farting beside the ‘ole campfire. Gemma hates farting. James loves it – by all accounts. A day on the sauce was had and what better way to end the evening than to sit around the campfire telling stories of old. And in Britain that means sitting round in the cold around the campfire. A campfire of soggy logs. There is a saying “Where there’s smoke there’s fire.” Not with this campfire there wasn’t . We got lots of smoke and very little fire. You had to trade warmth for suffocation as you had to literally stand on top of the fire to keep warm. Still, it didn’t dampen the spirits and the smoked marshmallows went down well. If only we’d brought some kippers. We had a big fry-up breakfast with more food to go round than planned as Gemma couldn’t face any food with the cracker of a hangover she had. Well, she is getting old now. 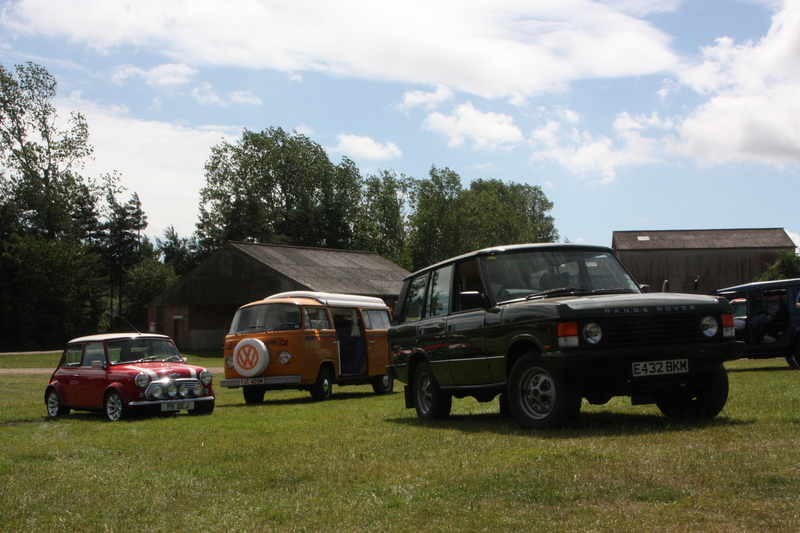 This entry was posted in The SapaBus Blog and tagged Campfire, Jazz Hands, Kent, land rover owner. ← BLOG 32 – WE’RE ON FIRE !!! Good to have you back on the blog Paul! I’m hoping to head up the coast in my van this weekend – the weather isn’t looking good, but that wont stop me! We’re heading down to Battle (of Hastings) for a couple of nights this weekend. Last time we were there, I kid you not, we saw a concrete mixer lorry liveried as “William the Concreter”. Made me laugh.